This entry will be a long one, since there is lots to catch people up on. Not all will be this lengthy, but I’ve been getting lots of questions (even from my good friends and family!) as to some of the details here. Since I have time this moring while Katherine does resupplies, I thought I’d take advantage of having my laptop to type some things out. -The new app I’m using to blog is BlogTouchPro and it’s the best option I’ve found for blogging from Blogger sites. Again, I’m stuck with Blogger for now since that’s what I started with, and I recommend WordPress to anyone that has the option to choose. -I want to give a reminder that the Hayduke is much more remote than the other trails I’ve hiked and my posts may be delayed(possibly more than a week) until I get service. They will still be daily, but they may come to subscribers in bunches when you get the email. I know I could space them out delayed, but I like to get up what I have all at once just to keep it as updated as possible. If you have the self control to do one entry a day, go for it…or just binge every week or so, ha! -Don’t worry if there isn’t a post for many days…even a week! My “Where’s Wired” tab will have my check-ins plotted along the route each day and you’ll see I’m still out there and moving. Love that map! -It can be difficult on this trail to know exact mileages, so my totals will be my best estimate many days. 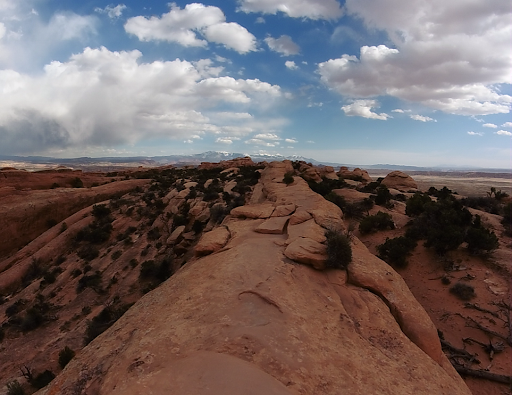 -I drove down to Moab rather than flying because I will need my car after the Hayduke to drive to the places in California I plan to hike and visit. 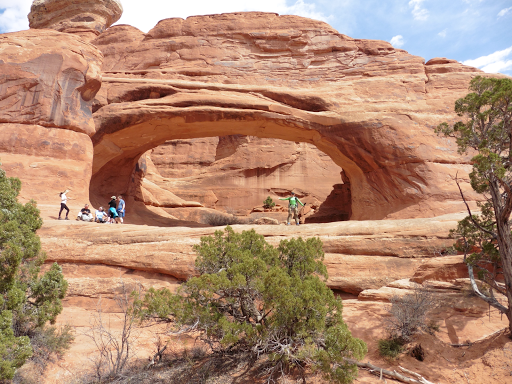 For us, the Hayduke starts in Arches National Park, which is just outside of Moab and ends in Zion National Park. To make a long story short, I have wonderful people willing to host me at each end (Moab and St George, UT) who are also able to shuttle my car from one end to the other (~5hrs) while I’m hiking. It really has worked out perfectly and if all goes to plan, my car will be in St George so I can drive to the Tahoe Rim Trail (7hrs away) at the end of the Hayduke. Thanks so much to all involved on this logistics end! 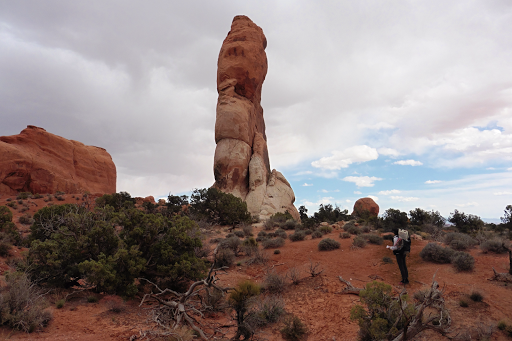 Last night, we arrived in Moab at 10:45pm having left Portland at 6am. There is a one hour time difference, but that made for quite the long drive of well over 15hrs. We stayed at the wonderful home of a family that is friends with a fellow hiker I know from the CDT(Maverick), yet never physically crossed paths with(again, love this hiker world!). 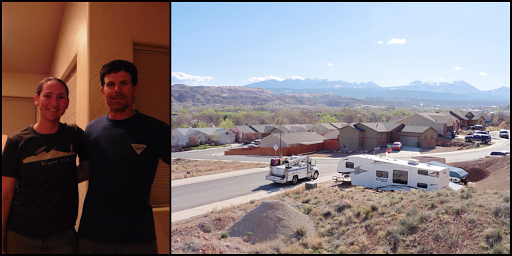 Jason works for the BLM and kindly offered to host us two strangers in his home that overlooks Moab and is just half a mile from where the Hayduke Trail runs through town. 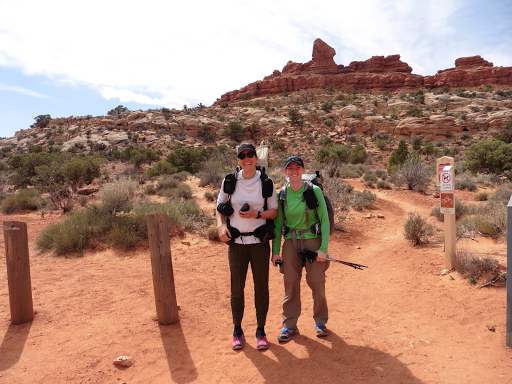 The first leg is a 2.5 day stretch that goes through Arches National Park and then you literally walk through Moab again, so we’ll be back at Jason’s in a couple days. His wife and kids were out camping, but will be here when we come back through. It’s wonderful to have a “home base of sorts” to start off an intimidating trail like this one. Thanks to Jason and his family for taking us in! There are couple options for starting the Hayduke and it’s indicative of much of this trail…many options and routes to consider. 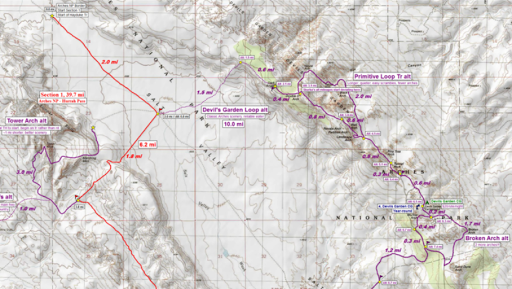 The cool thing is that if you fly into Moab, it’s just about a 4mi hike to the start if you wanted to hike directly from the airport. One of the people that offers shuttles to the trail is Hayduke co-creator Mike Coronella. We couldn’t pass up an opportunity to treat him to lunch before we hit the trail. He runs his own guide company here in Moab, so check it out if you’re looking for some great guided trips! 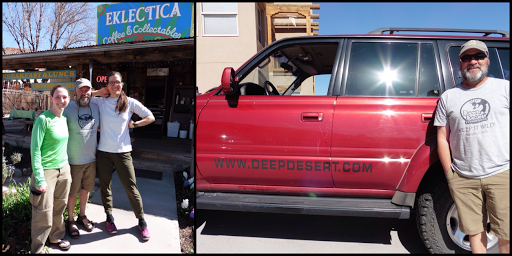 www.deepdesert.com His enthusiasm and love of this area is contagious and it was the perfect way to start the Hayduke. Thanks for the inspiration Mike! I’m going to show our map for today so people can get an idea of how all this works…this is the first map of Li Brannfors’ mapset. He has amazingly track logged in great detail many trials including the Pacific Northwest Trail, Arizona Trail, and Great Divide Trail. He does this all for free and I have mad respect for what he does to share his info and alternates with other hikers. When Katherine did the PNT in 2013, she track logged the route again for Li to help him with mapping and she has volunteered to do that again for him on the HDT. Really a great thing to help future Haydukers! Anywho, back to today…. This is very much a “choose your own adventure” kind of hike with many great alternates (some longer and more strenuous) to choose from. I’m terrible with names and details, but I’ll do my best on this trail. 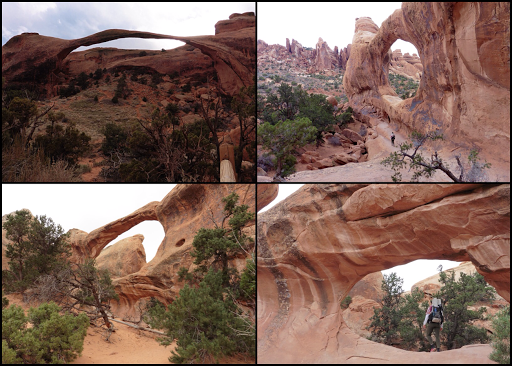 We did the Tower Arch and Devil’s Garden Loop alternates (alts in purple), which is generally the most popular choice even though it’s not the “official” route. Much of the Hayduke is like that. So the way to read that is that we started at the Tower Arch alt in the left corner(3mi). Until cutting cross country through low brush and cacti (2.1mi) to Dark Angel. Until our stopping point at Devils Garden Campground. The campground is booked months in advance, but a great family was kind enough to let us tent at their site since they had a motor home. Thank you! What a great way to start out a trail! Whew, I’m tired after all that. All is good so far. Regular adjustment aches are present in my calves and low heel Achilles. I had to stop three times to pour the fine sand out of my shoes, but no blisters…yet. Good to be back and to have all you coming along…just had to kick it off with the bang it deserves! Hope you enjoyed our first day!